The Six Mile Creek - Halsted Bay subwatershed is located along the southwestern boundary of the Minnehaha Creek Watershed District (MCWD or District) and within the cities of St. Bonifacius and Victoria and in Laketown Township and Watertown Township. The subwatershed is the most rural and undeveloped in the District, with agriculture the most common land use. The Three Rivers Park District's Carver Park Reserve in the central subwatershed contains rolling, wooded terrain, lakes, and wetlands, and is home to a wide variety of wildlife. The subwatershed contains several major lakes, including Pierson, Wasserman, East and West Auburn, Steiger, Zumbra-Sunny, Stone, Lunsten, and Parley Lakes. Six Mile Creek is formed at the outlet of Pierson Lake and flows 12 miles to Halsted Bay on Lake Minnetonka. The creek is mainly comprised of ditches running through large wetland and marsh areas connecting several of these lakes. Two of the lakes in the subwatershed are listed on the State's 303(d) list of Impaired Waters for excess nutrients, and Total Maximum Daily Load (TMDL) studies are being developed to plan for their improvement. Other lakes in the subwatershed either meet their water quality goals or strategies for their improvement have been developed in this plan. Many of these lakes are popular fisheries, and water quality improvement will assist in preserving their integrity. Six Mile Creek conveys significant phosphorus and sediment loads to Halsted Bay, and is a major cause of its poor water quality. The water quality in Six Mile Creek, its low gradient and the large number of wetlands through which it flows limit the biotic integrity of the creek. Numerous high-value wetlands are present in the subwatershed. Read the Six Mile Creek - Halsted Bay Subwatershed Plan from the MCWD Watershed Management Plan. In the first step toward sustainably managing common carp throughout the Six Mile Creek chain of lakes west of Lake Minnetonka, the Minnehaha Creek Watershed District (MCWD) and the University of Minnesota have begun a multi-year assessment to determine the abundance of common carp, how these carp move within and between lakes, and to identify the sources of young carp. Common carp are likely a key cause of poor water quality in the Six Mile chain, which begins at Pierson Lake in Laketown Township and flows 12 miles north through several lakes before entering Halsted Bay on the western end of Lake Minnetonka. Halsted Bay's water quality grade (D) is among the worst in Lake Minnetonka. Carp decrease water clarity and quality by stirring up lake bottoms and removing vegetation while feeding, thus upsetting the delicate balance of lakes. Because carp can reproduce at a young age, spawn millions of eggs per year, and are long lived, periodic removal of carp is usually not a sustainable solution. 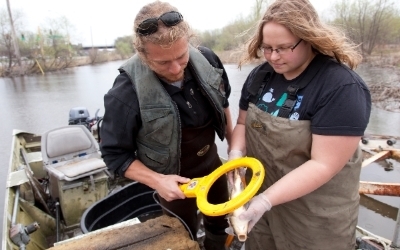 The study will use radio-telemetry tags implanted in carp, population surveys, and other techniques to get a detailed understanding of the abundance, movement patterns, and reproductive patterns of these damaging fish. The study will last for three open water seasons and will help the MCWD and its partners develop a long-term, sustainable carp management plan. Dr. Peter Sorensen, a professor at the University of Minnesota who heads the project with researcher Justine Koch has conducted similar studies in Minnesota and around the world that have led to long-term reductions in carp populations. He presented on some of the studies at the 2012 MN AIS Symposium, hosted by the MCWD. Read more about our habitat restoration efforts in Six Mile Creek - Halsted Bay.